You probably wouldn’t dream of diving into the murky waters of London’s Thames for fear of catching some dreaded waterborne disease or coming face-to-face with an old crisps packet, but in Copenhagen – after a decade-long clean-up operation – the city’s waterways have been totally revamped and are now swimmable. The harbour baths and nearby city beaches are all open to the public and are free to use; since the opening of the first harbour bath back in 2002, the transformation has been met with great gusto from the locals, who flock to the baths come rain or shine. 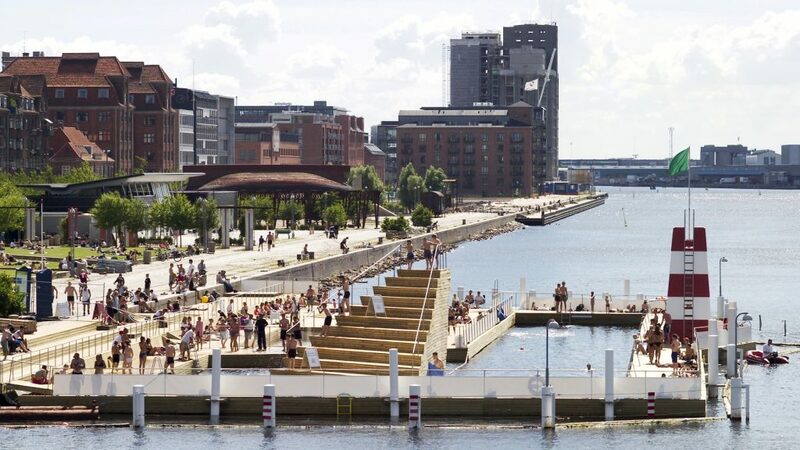 The first of the baths to open, Islands Brygge Harbour Bath – designed by famed Danish architect Bjarke Ingels – has now become a crucial fixture on Copenhagen’s waterfront. Nestled just below Langebro bridge, bathers can take a rigorous plunge into the harbour’s depths whilst surrounded by the pulsing cityscape. Just 5km from the city centre and easily accessible by the Metro, Amager Beach Park is popular with Copenhagers and in the summer months is rammed with some 70,000 beachgoers. From its sandy shores you’re treated to an arresting view over the windmill park and the Øresund Bridge linking Denmark and Sweden. If you’re looking to clock up some serious laps, visit Fisketorvet’s olympic-size outdoor pool where there are designated swimming lanes and plenty of diving boards. There’s also a separate children’s pool and on duty lifeguards during opening hours. 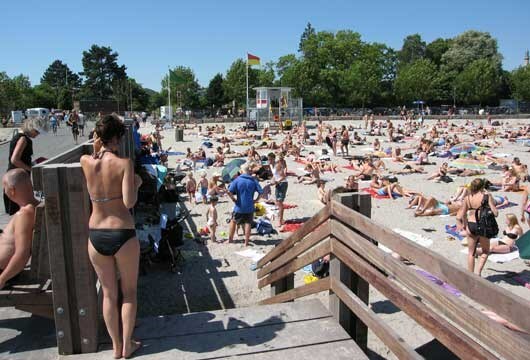 If you have a little more time and want to experience a bit of suburbia, then Klampenborg’s Bellevue Beach – about 10km from downtown Copenhagen – is the place to head to. The beach has several piers to jump from as well as watchful lifeguards and freshwater showers. Whilst you’re there, pay a quick visit to Bellevue Theatre – designed by Arne Jacobsen. 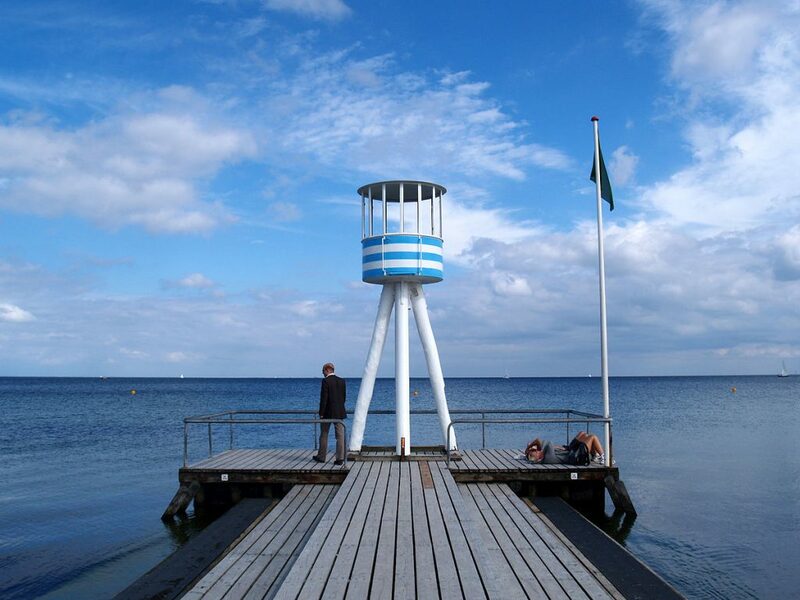 The newest addition to Copenhagen’s watering holes – finished in 2010 – is Svanemølle Beach. Its distinctive bay with a shallow gradient makes it perfect for families, and a 130m long pier provides access into deeper waters for any adventurous types. 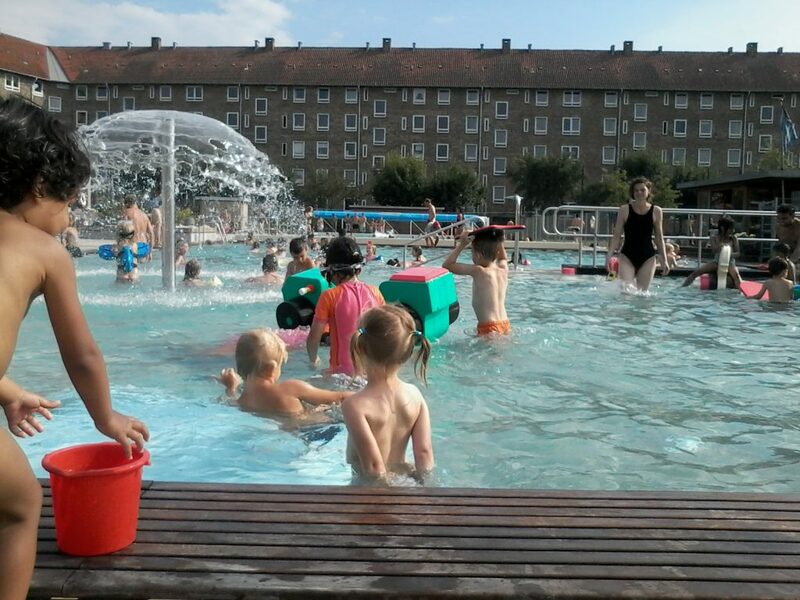 From its 12 online reviews, it’s all fours and fives for this public swimming pool, which on hot summer days is all arms and legs as local Copenhageners flock to it to cool off. The large paddling area and 25-metre pool, which has cordoned-off lanes for serious swimmers, are situated next to a large grassy area with climbing frames for children and volleyball, which make it the ideal spot to picnic and laze around. August in Denmark: Diligent Danes don't drown!